Why would I need self storage in Chattanooga, TN? There are a variety of reasons why you might need self-storage in Chattanooga, TN. How much is a storage unit in Chattanooga, TN? The cheapest storage unit in Chattanooga, TN is $18.00 per month. What size storage units do you have available in Chattanooga, TN? In Chattanooga, TN we have sizes that range from 5'x5' to 20'x30' to suit your storage needs. How much is it for a 5'x5' storage unit in Chattanooga, TN? The cheapest 5'x5' storage unit in Chattanooga, TN is $34.00 per month. 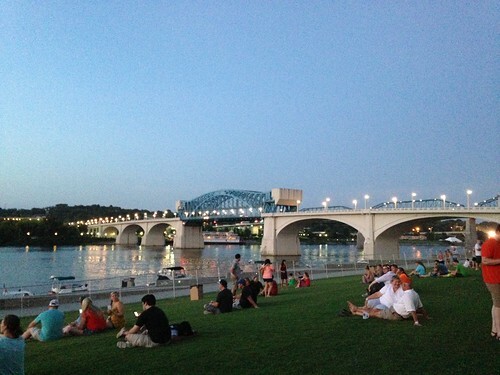 Chattanooga, on the Tennessee River, is one of Tennessee's largest cities. It has the nickname "Scenic City" because it's nestled among the beautiful Appalachian Mountains and the Cumberland Plateau. Chattanooga has also earned several other unique distinctions, ranging from being the subject of a famous 1940s song to being the first American city to have its very own custom-made font. Native Americans have inhabited the area that's now Chattanooga for many generations, with several different tribes calling the region home. The name of the city is a reference to nearby Lookout Mountain, a large mountain ridge that was the site of two separate Civil War battles. The city was incorporated in the late 1800s and became a major boomtown once the railroad arrived. Chattanooga played an important role in the Civil War, thanks to its strategic location and well-developed transportation network. The city continued to grow through the early 20th century, and was the first Tennessee city to earn a spot on the interstate highway system. During the 1980s, Chattanooga's population declined, but it has since bounced back, thanks to dedicated rejuvenation efforts. The city has received several awards for its excellent livability and city planning. Chattanooga is home to a large variety of attractions, truly offering something for everyone. On the banks of the Tennessee River you'll find plenty to do, like visiting the Tennessee Riverwalk. This 13-mile path is ideal for walking, jogging, biking or walking your dog, and you can also enjoy the stainless-steel sculptures dotting the park. If you're interested in learning more about the city's history, you can visit Point Park and the Battles for Chattanooga Museum, which detail Chattanooga's role in the Civil War. Or explore one of the city's historic districts, like St. Elmo. Chattanooga also offers plenty of places to enjoy the beautiful Tennessee weather. Ruby Falls is a popular natural attraction, centered on an underground waterfall that towers nearly 150 feet high. Point Park provides sweeping views of the city and surrounding scenery, and there are a number of natural preserves, arboretums and gardens near the city. A number of special events take place in the city, ranging from athletic competitions like the Head of Hooch rowing regatta to the Riverbend Festival, one of the region's best-known music festivals. Founded in 1910, Ferger Place was the very first gated community south of the Mason-Dixon Line. The original entrance pillars still stand, as do many of the post-Victorian style homes that housed some of the wealthiest businessmen of the early 20th century. This neighborhood sits atop a major mountain ridge, serving as the site for the Civil War battle of Missionary Ridge. Today, it's home to a number of upscale homes, several of which feature Civil War plaques and monuments in their yards. Fort Wood borders the University of Tennessee Chattanooga, and its historic homes host many school offices, fraternity houses and student apartments. Several Civil-War-era cannons are scattered throughout the neighborhood, a nod to its origin as a Union Army fortification site. Highland Park is one of Chattanooga's most popular neighborhoods, thanks to its proximity to downtown and a large collection of renovated historic homes. It was named the 2001 Neighborhood of the Year by the Neighborhoods USA organization, and it has been featured in many major publications. The Hamilton County Department of Education serves the public schools. The district manages a handful of magnet schools operated by the district, as well as several well-rated programs for gifted and talented students. The city is home to several top-rated private schools offering both faith-based and secular education. If you're considering pursuing your college degree, you have several options in Chattanooga, including the University of Tennessee at Chattanooga and Chattanooga State Community College. Utilities: EPB is the city's central electricity provider, while the city manages water and sewer services. If your home utilizes natural gas, your provider will be Chattanooga Gas. Garbage and Recycling: Recyclables are picked up every other week. Trash is collected curbside once a week. Transportation: The CARTA bus service provides public transportation around the city and includes a free shuttle service in the downtown district. Both the median home value and average rent price fall below national averages, making Chattanooga a relatively affordable place to live. You'll find that there are a number of options, whether you are looking for a compact apartment or a spacious, single-family home. Our lowest priced units in Chattanooga, TN average $31.10 per month. 485 people have reserved units in Chattanooga, TN in the past 30 days. There are 10 locations within Chattanooga, TN's city limits. There are 6 locations in Chattanooga, TN that offer AC and Heating features.